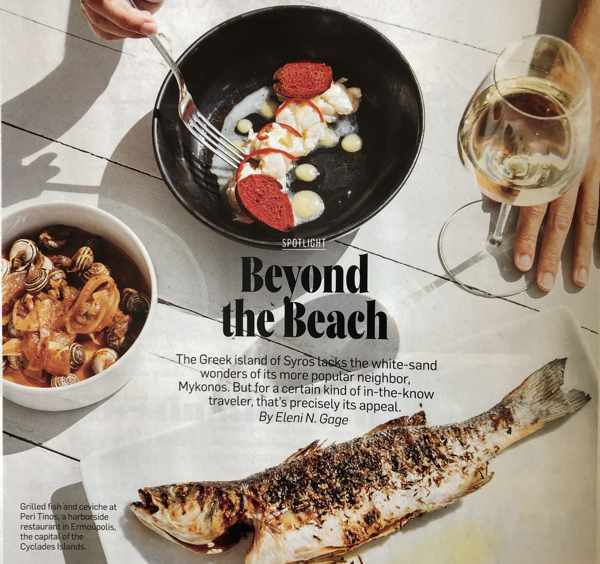 Appetizing island: “Island Escapes” is the theme for the February 2019 issue of Travel + Leisure, and Syros steals the spotlight as the only Greek isle on the menu of getaway destinations profiled in the magazine. 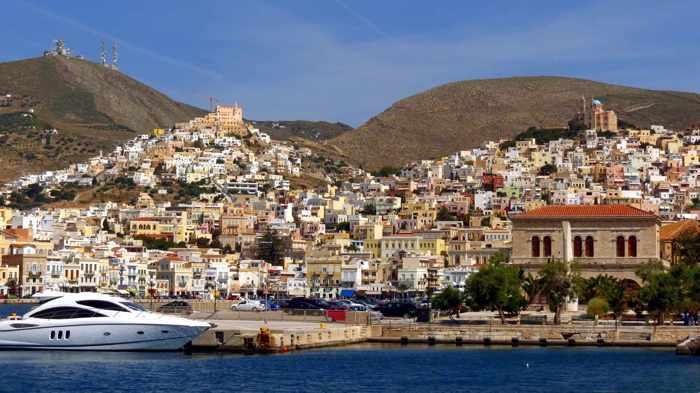 Ermoupolis, the colourful capital and port town of Syros. 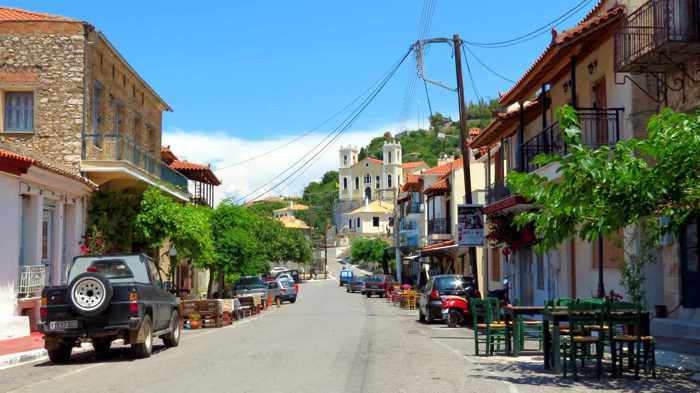 “The fact that the island has a thriving city by the sea makes it alluring to those interested in life beyond the beach,” Eleni notes in her article. 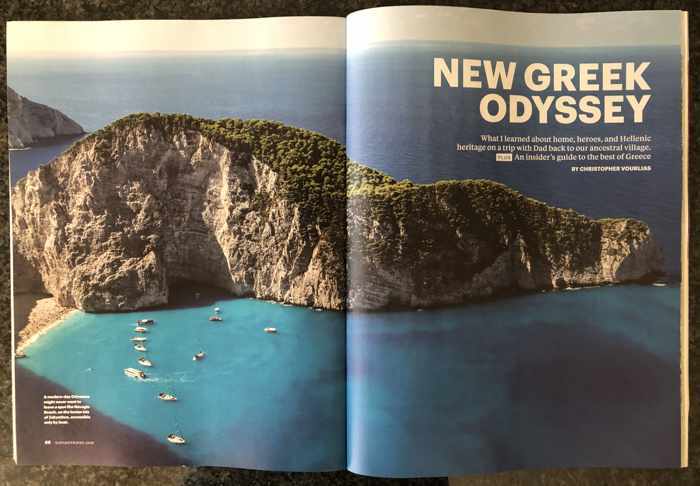 Since Syros is one of our personal favourite places in Greece, I couldn’t resist buying the magazine when I saw the island mentioned on the front cover. I was curious to read what kind of impression Syros had made upon Eleni, whose feature articles about a number of destinations in Greece have appeared in top international travel and lifestyle publications. Not surprisingly, she fell in love with Syros, too. 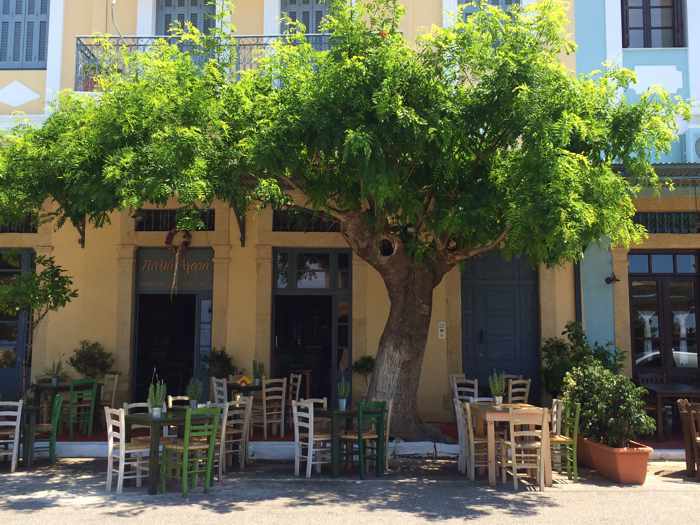 ♦ restaurants where Eleni and her family dined (they had a memorable meal at one place we thought was excellent, too: Peri | Tinos, on the Ermoupolis waterfront). While we’re familiar with most of the places Eleni described, I was glad she did mention a few we haven’t seen — they’re now on a list of things to do next time we travel to Syros. My only disappointment was that the article wasn’t longer — I really wanted to read more about Syros. Nevertheless, it did made me yearn to go back. Please click on the link below to turn to page 2, where I have posted some of our photos that show a few of the places mentioned in Eleni’s article. 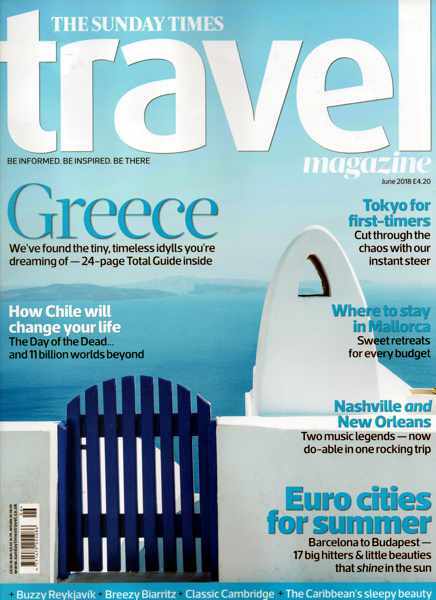 Fab food & drink: Take us to a town or village with sensational views and scenery, and we will probably like it. If there are archaeological sites, or historic buildings or places close by, we will certainly like it even more. Picturesque streets and interesting architecture? Beautiful beaches, majestic mountains or scenic seasides in the vicinity? A relaxed setting and laid-back atmosphere? Those are guaranteed to tick off even more boxes on our “like” list. But a destination won’t completely win our hearts if we don’t go home with fond memories of restaurants and cafes. (We’re not foodies or wine snobs by any stretch of the imagination, but we do like to eat, we love good coffee, and we enjoy sipping some nice wine as well.) 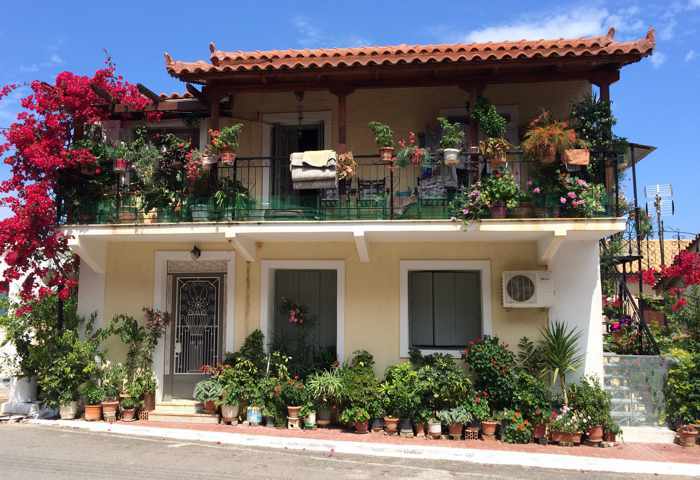 Since Kyparissia has many of the characteristics that make us happy on holiday — plus really good food and drink in particular — we couldn’t help but love our short visit there in May 2017. 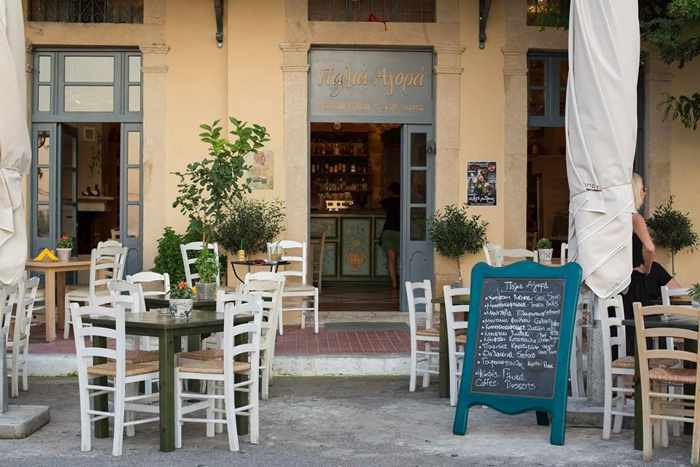 What impressed us on the food & drink front were three places we discovered in the charming Ano Poli (Old Town) district of Kyparissia: a shop selling a wide range of local food items and other Made in Messenia products, a comfortable cafe-bar; and a delightful estiatorio – mezedopoleio. 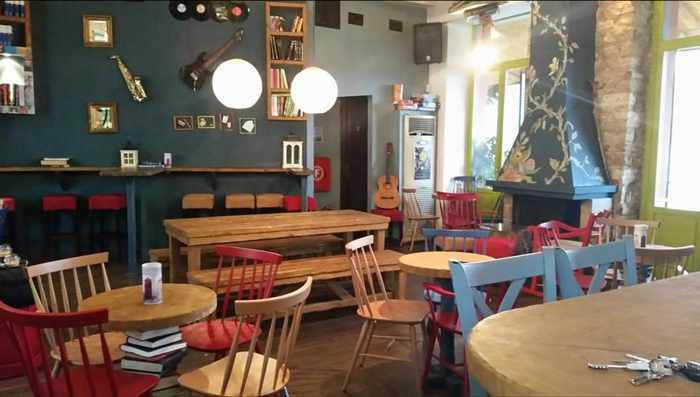 Conveniently and coincidentally enough, all three establishments were located just a stone’s throw apart on Eleni Chameri Street, the main road of Ano Poli. A late lunch at Palia Agora was the highlight of our afternoon in Kyparissia. We took one of the tree-shaded tables in front of the restaurant and ordered wine and a selection of cold and hot mezes (small plates perfect for sharing), then sat back and relaxed while our meal was prepared. The local wine was delicious, and the food was amazing. In fact, it was one of the best meals of our spring 2017 vacation. Some of the standout dishes included the grilled pleurotus mushrooms, local sausage, pork slices accompanied by potatoes and pieces of oranges, the fava with olives and onions, and cheese balls rolled in chopped pistachios. Equally impressive was the friendly and efficient service. 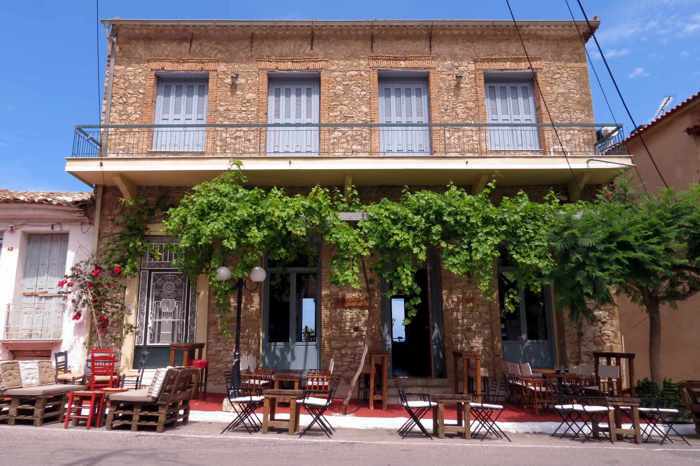 We would go back to Kyparissia just to have another meal here, the food was that good. You can read over 200 customer reviews, and see more than 100 photos of the restaurant and its tasty dishes, in the Palia Agora listing on TripAdvisor. There are dozens of additional photos on the Palia Agora Facebook page. The grilled pleurotus mushrooms (left) were divine. Also tasty were the cheese balls rolled in chopped pistachios, and served with a salad and pita. 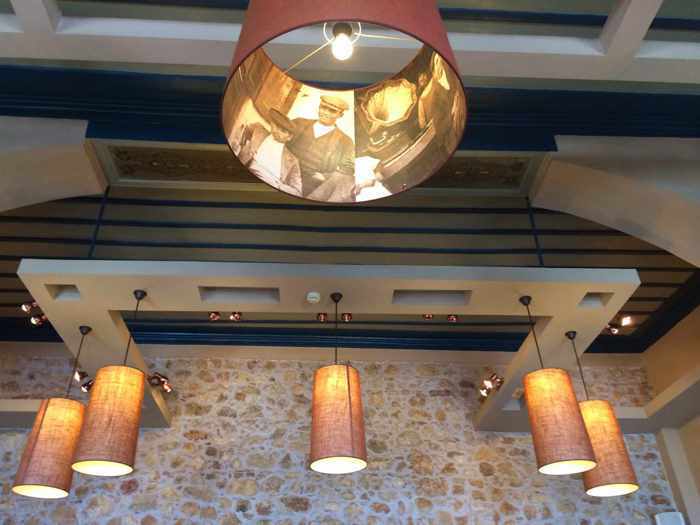 If you visit Palia Agora for a meal but sit outdoors as we did, make sure to take a peek inside the restaurant to check out the lovely decor and the interesting interior design details, like the light fixture above. 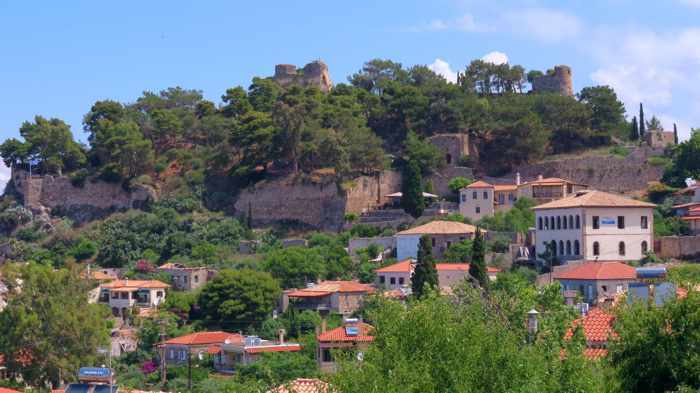 We stopped at Algo-rithmos for two coffee breaks during our walkabouts through the Old Town and to the Castle of Kyparissia. We sat at one of the tables out front, next to the street, both times, but we could have chosen to sit inside or on the town- and seaview veranda at the rear of the building had we preferred. The service was friendly and prompt, and we liked the music that was playing. 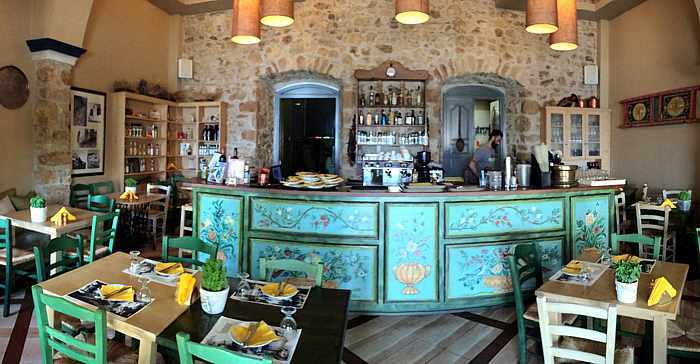 You can read more about the cafe-bar in the customer reviews posted on the Algo-rithmos listing on TripAdvisor. Travelling shopaholics won’t find many stores to browse in Ano Poli, but they will find it worthwhile visiting Messinia Gi, especially if they like to support regional artisans by “shopping local” for food, fashion accessories and other items to give as gifts or to take home for personal use or souvenirs. Messinia Gi boasts an extensive selection of food, beverage, fashion and souvenir products made either locally or in the Messenia region. Food items on offer include sweets, healthy snacks, honey, packages of handmade pasta, olive oil, olives, herbs and spices, nuts and many more. General merchandise includes jewellery and other women’s fashion accessories, personal care products, and ceramics. (You can view dozens of photos of the shop’s seasonal and regular merchandise in the albums and posts on the Messinia Gi Facebook page, and see additional pictures on the Messinia Gi listing on TripAdvisor. We picked up postcards and several local food items to bring home for friends and ourselves, including jars of delicious figs stuffed with nuts, while our friends walked out with several bags containing what looked to us like enough food to prepare a week’s worth of meals once they returned to Athens. The pleasant young lady who was minding the store was very helpful in explaining the contents and sources of the various food items we were considering, and in making suggestions for products to try. 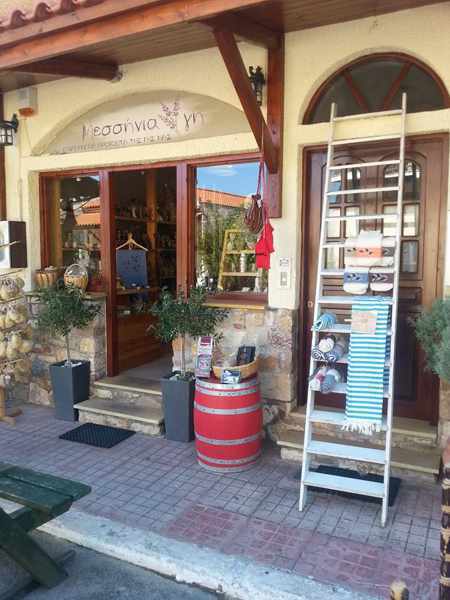 If you’d like to take home some tastes of Messenia, be sure to visit the shop while you’re in or near Kyparissia. 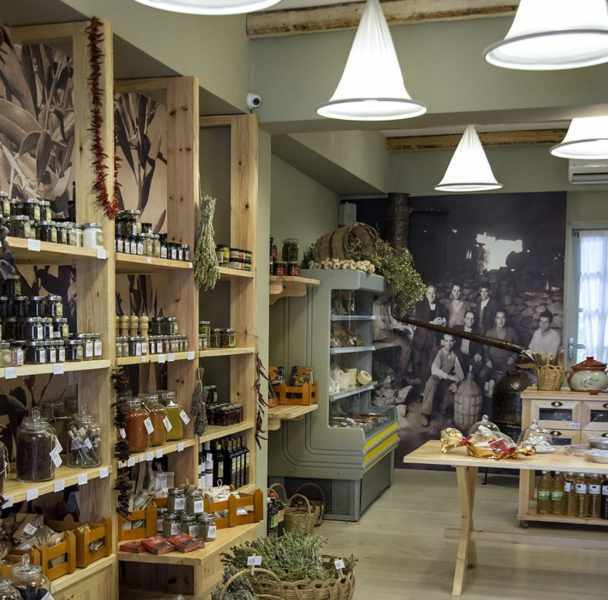 If you visit the Old Town, you’ll find a vast variety of local products at Messinia Gi. The made-in-Messenia items make great gifts or personal souvenirs. This photo of the storefront is from the Messinia Gi page on Facebook. 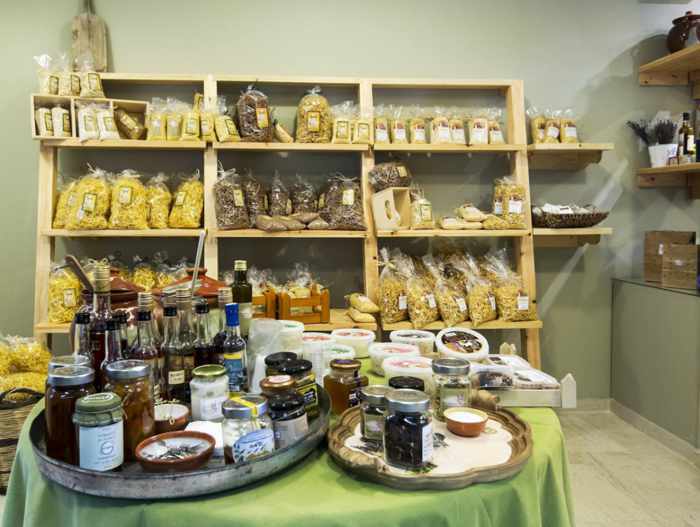 Local product displays are shown in this photo that Messinia Gi management provided for the shop’s listing on TripAdvisor. Below is another photo of the store interior, also from its TripAdvisor listing. 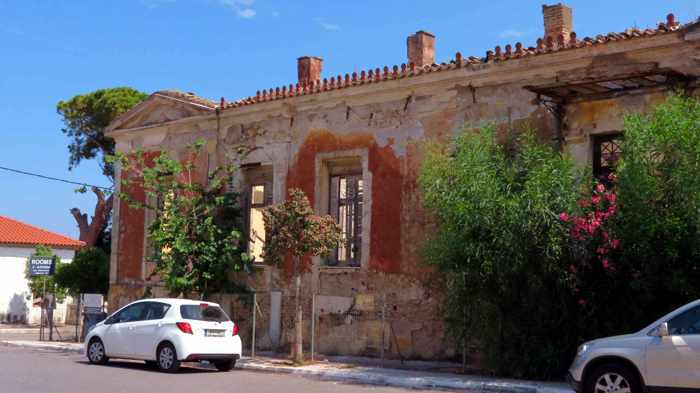 Impressive introduction: On the fourth day of our May 2017 road trip through the western Peloponnese we discovered another charming town to which we will have to pay a longer return visit sometime: Kyparissia. We had scheduled Kyparissia for just a sightseeing stop during our drive from Marathopoli to Katakolo, yet within minutes of stepping out of the car we were already wishing we could stay longer than just the afternoon. That strong first impression came from the quick realization that Kyparissia has all the key features and characteristics we find particularly appealing in a small Greek town: beautiful scenery and views; a castle and lots of old buildings that convey a strong sense of history; plenty of intriguing lanes and streets to wander and explore; picturesque buildings and interesting architecture; inviting places to have coffee, dine, and do a bit of browsing or shopping; and a comfortable “I feel at home here” ambiance. 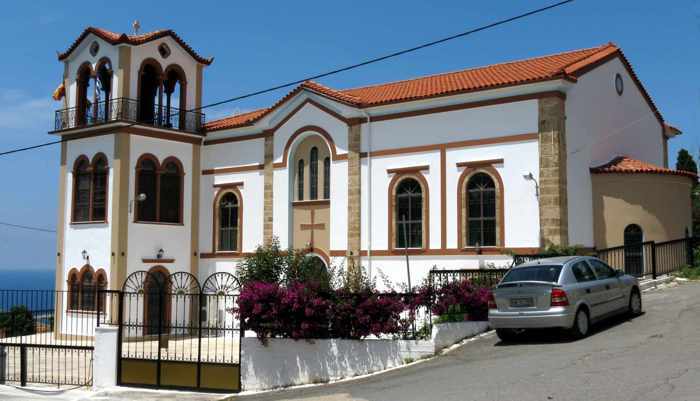 However, with fewer than five free hours before we would have to hit the road again, we knew we were only going to scrape the surface of all that Kyparissia and its surrounding area have to offer. Still, we enjoyed everything we did manage to see and do in our limited time, and we were glad we had included the town as one of the stops on our journey. 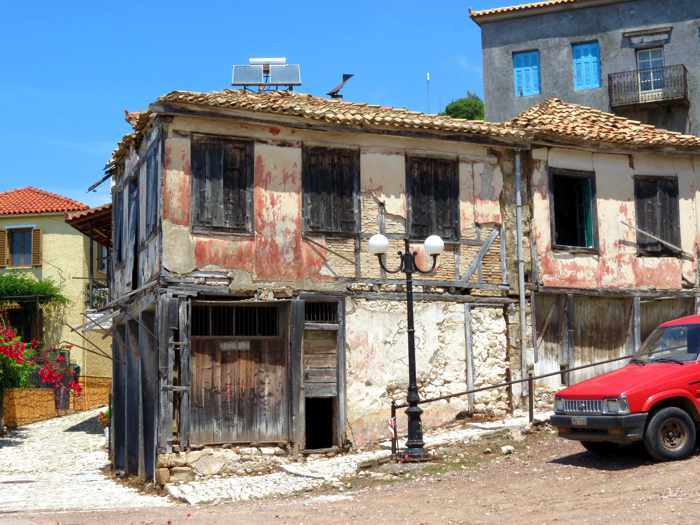 We would consider Kyparissia to be a “must see” destination for anyone undertaking a driving tour like the one we did through the western Peloponnese, and we think it definitely deserves more than a quick look around. When we arrived at El. 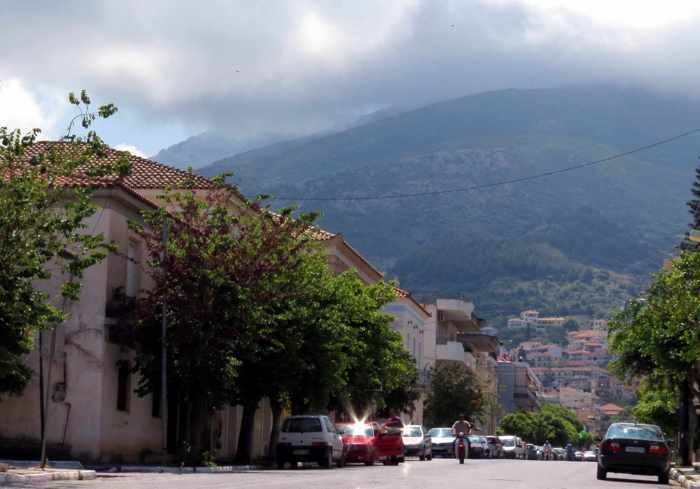 Venizelou Street in Kyparissia in late morning, clouds above the nearby mountains suggested we might get rained on. But most of the clouds cleared away, leaving us with bright sunshine all afternoon. Upon arrival in Kyparissia, we parked briefly on El. Venizelou Street in the lower town so we could have a look around and check out a few of the shops. The road was lined with a mix of commercial and residential buildings from different architectural design eras, including elegant old buildings, some of which — like the former National Bank — were in derelict condition, and others that were either in excellent shape or appeared to have been painstakingly restored. 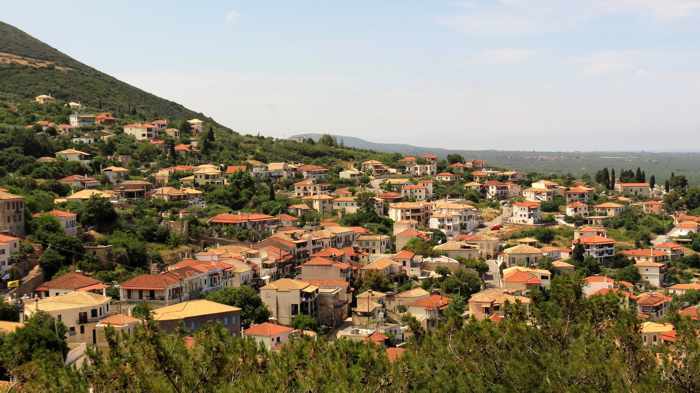 They gave us a sneak peak of the wide variety of building design styles and construction periods we would soon encounter in Kyparissia’s Ano Poli, the historic hilltop Old Town, where we had planned to spend most of our time. Our next stop was Eleni Chameri Street, the main road in the Old Town, where we found on-street parking close to the Memorial of the Fallen. 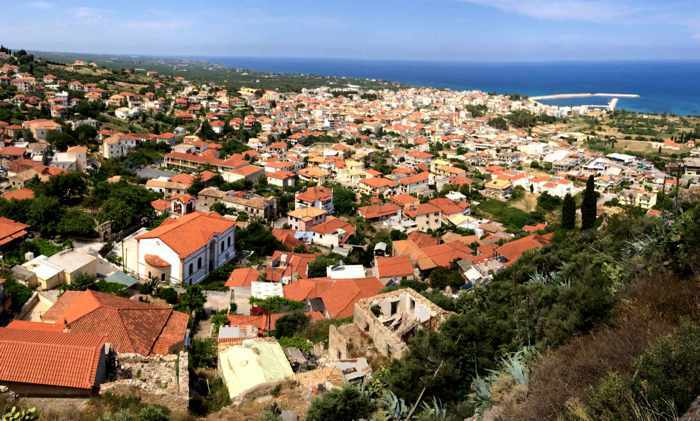 The war monument is situated in a small square with amazing views that include the Castle of Kyparissia off to the right, and the entire town below, extending all the way down the hill to the sea. From the memorial we walked to the Castle of Kyparissia, located at the opposite end of Eleni Chameri Street. We strode through the open gate (there is no ticket booth at the entrance) and climbed steps and trails up the hillside to see what remains of the ancient fortress. Apart from the external fortification walls, only a few stone buildings still stand on the site — but none are open to the public. 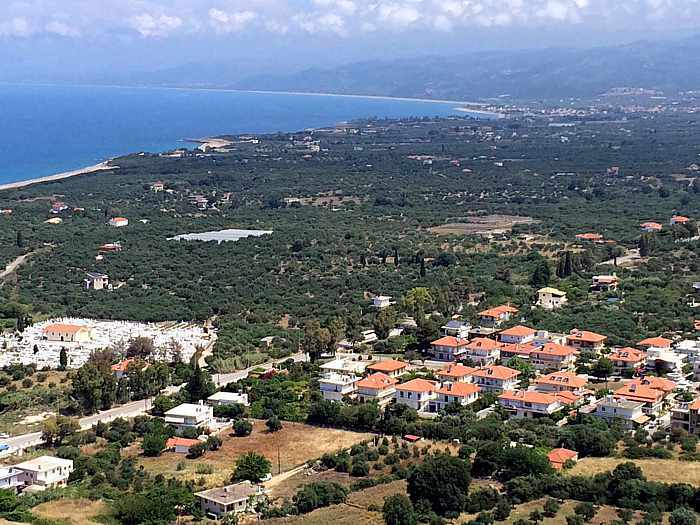 It doesn’t take long to wander around and explore the grounds, but the castle is worth a stop, especially for its wonderful views of Kyparissia and the surrounding area. After our castle hike we returned to Eleni Chameri Street and made a beeline for Algo-rithmos Cafe Bar, where we sat in the shade at one of the tables out front to have coffees and rest our legs. Refreshed from our coffee break, we all set out on our separate ways to explore the Old Town and vicinity. There was little traffic and only a few people out and about, so the neighbourhood was exceptionally quiet and peaceful. It was nice not having to jump out of the way of passing cars and trucks, or jostle past other pedestrians, while observing the scenery and taking photographs. The place is probably bustling during July and August, so we were glad we got to enjoy the town’s scenic streets and lanes without hordes of tourists teeming about. We regrouped back at Algo-rithmos for another coffee break a couple of hours later, then did some souvenir shopping across the street at Messinia Gi, a store which carries an extensive selection of food, beverage, fashion and souvenir products made locally in Messenia. After more walking around, we all agreed it was time to call it quits on sightseeing, and find a nice spot for lunch. 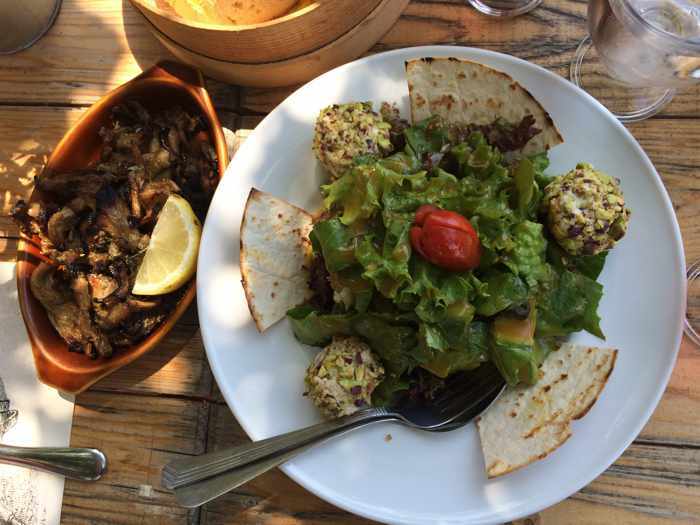 We chose Palia Agora, which is located just a few doors down the street from Messinia Gi, where we sat outdoors and enjoyed a variety of delicious mezes. I will tell you more about Messinia Gi and Palia Agora in a separate post. The fabulous meal brought our brief Kyparissia visit to an end on a high note. We reluctantly piled back in the car for the drive to Katakolo, where we would spend the night before heading to the port at Kyllini to catch a ferry to Kefalonia. 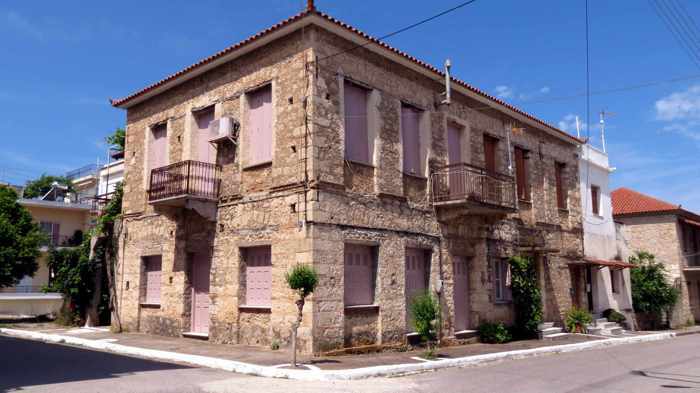 We’ll go back to see more of Kyparissia another time. We’ve got to — it’s exactly the kind of place where we enjoying spending vacation time. Please click on the link below to turn to page 2, where I have posted more photos of the Old Town and castle, as well as a video of the castle and its views.